Dream Pod 9: HGB Peace River & NuCoal Core Plastic Miniatures Kickstarter is Live! 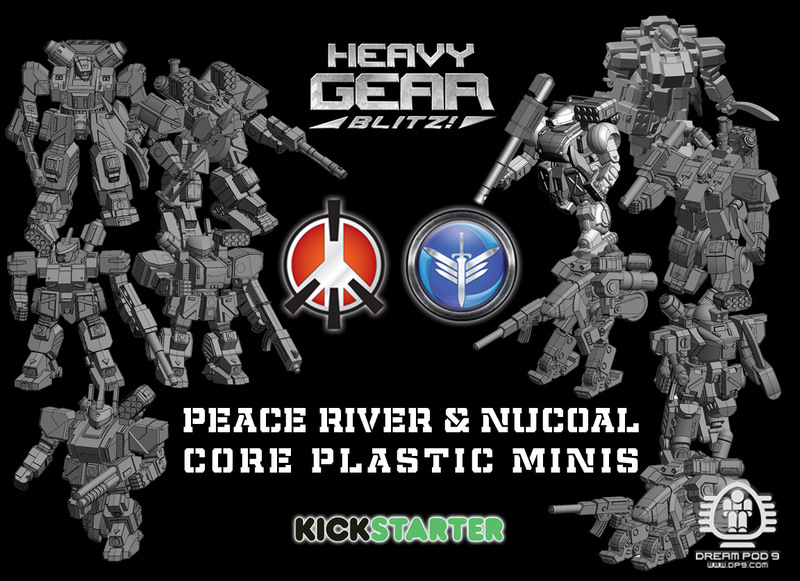 We just launched our Heavy Gear Blitz Peace River & NuCoal Core Plastic Miniatures Kickstarter at 7:05 pm EST today (April 26th, 2018). The Kickstarter campaigns initial goal is to raise $25,000 CAD (about 19.3K USD) needed to make the first plastic injection mold for the new plastic miniatures and backer rewards. The campaign will run for 30 days ending on Saturday evening at 7:05 pm EST (May 26th, 2018). We need everyone's support to make these new plastic miniatures for the Peace River and NuCoal factions a reality and if you can share news of the Kickstarter with friends and the online community it would be a great help. We have a great Peace River and NuCoal Army Commander Reward Levels at $70 CAD (about $53.85 USD) each. Which include a faction patch and 2 squads (General Purpose and Strike) with a total of 8 plastic miniatures each. Stretch Goals, once unlocked, will add Fire Support and Recon models to the armies and increase the total to 19 plastic miniatures for each army. We also have a great deal with our Badlands Commander Reward Level at $100 CAD (about $77 USD) that includes the Peace River and NuCoal Patchs and Armies of 2 squads (General Purpose and Strike) each for a total of 16 plastic miniatures starting out. 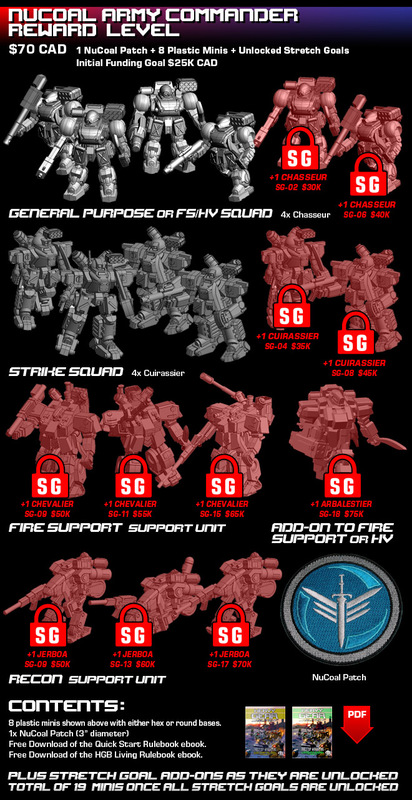 Stretch Goals, once unlocked, will add Fire Support and Recon models to the armies and increase the total to 38 plastic miniatures. 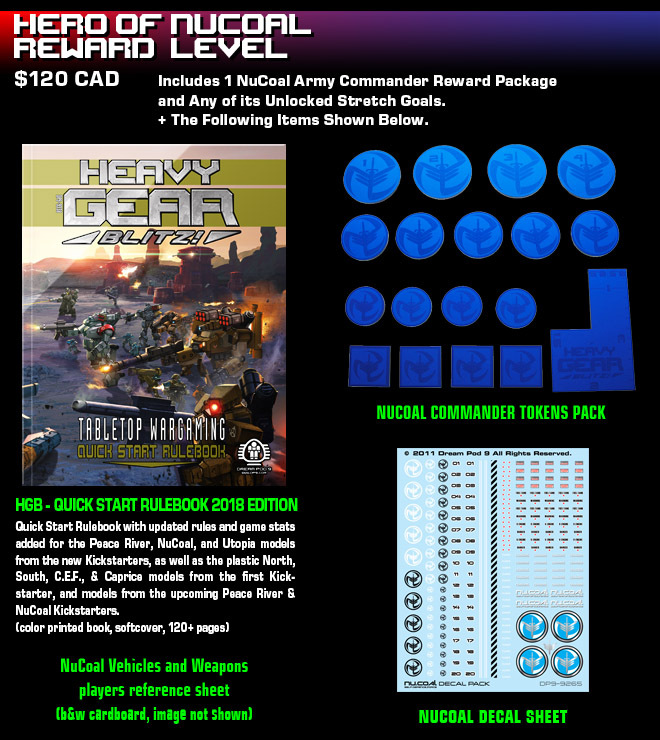 Plus we have Hero of Peace River, NuCoal, and Badlands Reward Levels that include the Commander Reward Packages plus add a copy of the full color printed HGB Quick Start Rulebook 2018 Edition. The planned new edition will updated the rules and add the Peace River, NuCoal, and Utopia Kickstarter model lists sections to the Quick Start Rulebook. 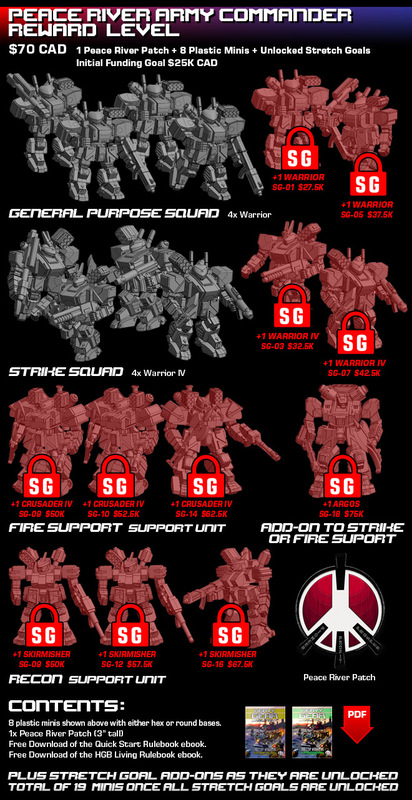 Also included in the Hero Reward Levels are faction Decal Sheets, Commander Token Packs, and Vehicles and Weapons players reference sheets. Plus new pewter and resin miniatures releases for the Peace River faction. Show your support for Heavy Gear Blitz by clicking on the link below and making a pledge today! Home › Blogs › Robert Dubois's blog › HGB Peace River & NuCoal Core Plastic Miniatures Kickstarter is Live!